River Aare has its origin in the alpine Bernese Oberland region and runs through the central part of Switzerland's most populated plateau region. At the northern border to Germany, near the twin towns Koblenz (Switzerland) / Waldshut (Germany), River Aare flows into River Rhine. The name Koblenz comes from Latin Confluenza [flow together]. Aa is basically an old German word for any running water in contrast to lakes or to the sea. Many brooks in Switzerland are simply called Aa or have a name combining Aa with some local name. So its name already expresses that River Aare is the Swiss river par excellence, while the other major Swiss rivers, Rhine and Rhône, run through peripheral regions or mark the border to neighbouring countries. River Aare originates in a couple of glaciers feeding storage lakes in the Grimsel Area (south-eastern end of Bernese Oberland, north face of Bernese Alps). The first section of river Aare from the Grimsel lakes down to Haslital with villages Innertkirchen and Meiringen is relatively steep. Between Innertkirchen and Meiringen, river Aare has to pass the Aareschlucht, a narrow canyon with steep rock walls on both sides. From Meiringen on, the terrain gets relatively flat and the valley is more open. 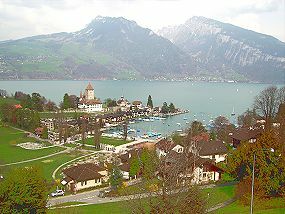 Brienz marks the upper end of Lake Brienz. 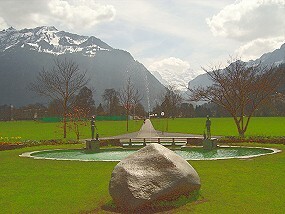 Interlaken [the originally Latin name means: between the lakes] sits between Lake Brienz and Lake Thun and is also a gate to the first major side valley, Lauterbrunnental with resorts Lauterbrunnen, Mürren, Wengen and Grindelwald and the famous Bernese Oberland mountains Eiger, Mönch and Jungfrau. On the left shore of Lake Thun Spiez is a small railway hub giving access to two side valleys Kandertal (river Kander, resorts Frutigen and Kandersteg, Lötschberg railway line and tunnel to Wallis / upper Rhône valley) and Simmental (river Simme with resorts Zweisimmen, Lenk im Simmental and scenic Montreux-Oberland railway line). Thun, located at the lower end of Lake Thun, is the 10th largest city of Switzerland and economic center of the Bernese Oberland region (though geographically located at the end of the region). Bern, Switzerland's capital and 4th largest city (or at least it's medieval downtown nucleus) is built on a rock surrounded on three sides by a loop of river Aare. 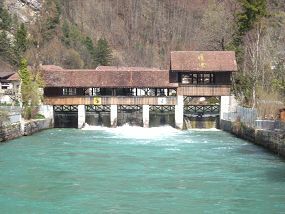 River Aare used to devastate large plateau areas by inundations in past centuries. To stop this, hydraulic engineering measures were taken. Hagneck channel leads the waters to Lake Biel serving as a huge compensation basin. The old course of River Aare between the village of Aarberg and Büren a. Aare still exists, but is only a small brook nowadays. A second channel, Zihlkanal directs the waters from Lakes Neuchâtel, Murten and Biel to Büren. River Aare is calm and a little lazy on the plateau with very low decline - except near power plants, where it may become very dangerous to swimmers and canoeists. A large area between Grenchen and the city of Solothurn has been declared a nature protection zone. Wanderers and bikers are welcome as long as they don't leave the trails. 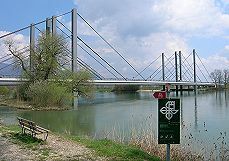 Modern traffic demands a tribute, however: a Autobahn [4-lane interstate/expressway] bridge cuts the area into two. 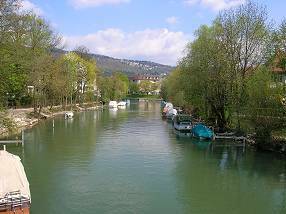 River Aare follows the Jura mountain chain in its crescent form from southwestern to northeastern Switzerland. Olten, Aarau [once more, the river has given its name to a city] and Brugg are the major cities and towns until River Aare unites with rivers Reuss and Limmat near Turgi and feeds Lake Klingnau a storage lake that is very popular among water fowl from northern Europe in winter and consequently among hobby ornithologists. From there it is only a very short distance to Koblenz, where River Aare joins River Rhine. Saane is the German name, Sarine the French name for a river originating in western part of Bernese Oberland with resorts Gstaad and Saanen. River Saane/Sarine roughly marks the border between the German and French speaking parts of Switzerland. From the source down to Saanen, the direction is roughly from south to north, at Saanen the valley becomes an elevated plain at 1000 to 900 m [3300 to 2900 ft] stretching from east to west. At Montbovon, River Sarine's valley becomes narrower again and the general direction changes back to south - north. Near Gruyère castle and town, home of famous Gruyère cheese, River Sarine feeds Lake Gruyère, a drawn-out prealpine lake. Fribourg is the only major city on River Sarine, sitting high above a canyon protecting the city with its loops. Fribourg/Freiburg is, together with Biel/Bienne, the prime example of a bilingual Swiss city, hosting Switzerland's only bilingual university. Some 25 km [15 mi] downstream, River Saane joins River Aare on its way to Lake Biel/Bienne. River Orbe originates at the Swiss/French border, feeds Lac de Joux and disappeares in the karst crevices typical for jurassic limestone - only to appear again soon near Vallorbe town. Orbe [from Latin urba = town], at the transition from the Jura mountains to the Swiss plateau, has given its name to the river. River Orbe feeds Lake Neuchâtel at its south-western end near the city of Yverdon-les-Bains. River Areuse originates in Val de Travers (Jura mountains) and finds its way through a gorgeous canyon down to Lake Neuchâtel. River Grosse Emme originates in the Bernese (western) part of the prealpine hills between the valleys of Rivers Aare and Reuss. Just to bewilder nowadays tourists, the inhabitants of the region refused to find two different names for their main rivers running to the west and to the east. So the only distinction (if at all used) is the adjective "Grosse" [grand] for the western Emme joining River Aare and "Kleine" [small] for the eastern Emme joining River Reuss. Emmental, on the other hand, denotes only the valley of River Grosse Emme and its side valleys. 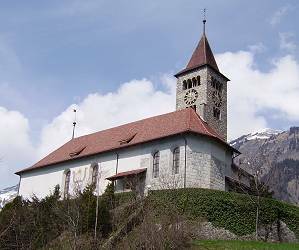 Several names of villages can be found in other parts of Switzerland, too. To mark the difference, those located in the Emmental region are written with an "i.E." [im Emmental = in Emmen valley]. 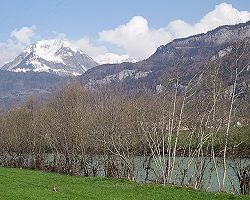 Prime example is the district capital Langnau i.E.. Near Burgdorf town, River Grosse Emme leaves the prealpine zone, crosses the plateau and joins River Aare shortly downstream of Solothurn.